An example of the growing partisan divide measured by Gallup’s pollsters in March. See the chart below for complete results from the organization’s latest poll on global warming. Last year, Gallup’s annual nationwide poll on global warming, the manmade phenomenon that’s driving disruptive climate change, discovered public concerns at their highest levels since the organization started asking about the issue in 2001. Generally, Republicans have lagged well behind Democrats and Independents over the years in their acceptance of climate science and in their stated concern about climate change. Last year, Gallup found that gap widening — concern among Democrats and Independents jumped from 2016 to 2017, while Republican concern stayed about the same as it had been in recent years, at steady though much lower levels than among other Americans. In the 2018 edition of the poll, conducted last month, Gallup found that perennial partisan divide had widened even more. This time, Democrats’ concern continued to grow, while concern among Republicans and Independents was lower. To get another well-informed interpretation of the Gallup-measured opinion trends, TCN posed several questions by email to Sheril Kirshenbaum, who was director of the now-suspended University of Texas Energy Poll for six years. What do you make of the growing partisan divide on Gallup’s questions, with both Republicans and Independents moving away from acceptance of the science and support for action? It’s not very surprising at all. The changes in attitudes since 2017 aren’t that large and climate change is a very politicized and partisan issue. Why does it seem to be widening again? 2018 is an election year, and Americans are more polarized than we’ve been in a long time. I expect we’d see similar trends on a variety of policy issues. Is this reflected in other recent polls? 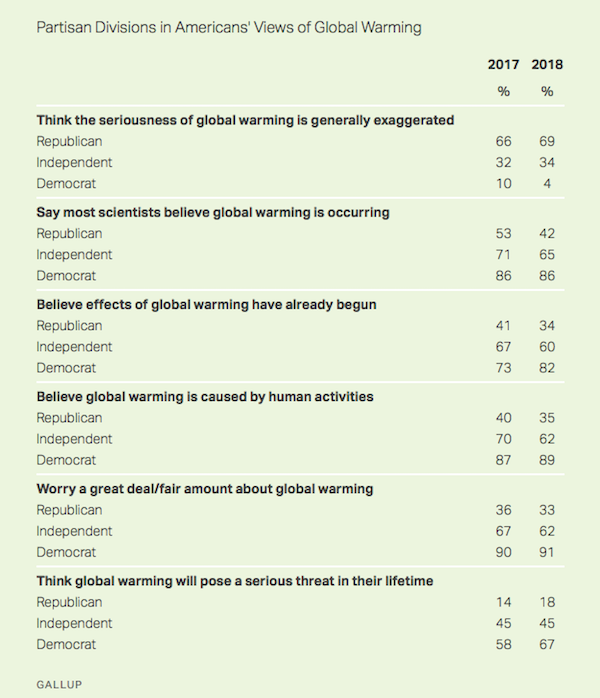 Gallup’s people seemed to minimize the shift’s importance in their interpretive text accompanying the poll, instead stressing that climate concerns continue to register near last year’s record-high all-time number for the public as a whole. As someone who cares very deeply about the importance of science in the political discourse, what do you think are the reasons for these changes, especially among Republicans? On climate change (and on pretty much everything), we’re influenced more by how we feel than facts. So piling on additional scientists and data related to climate change isn’t necessarily going to make a huge difference on public sentiment. As I wrote earlier, climate change is deeply politicized, and Americans are going to turn to the people they trust most, which are often talking heads as well as family and friends on social media that reaffirm our beliefs. In 2018, this environment makes us more polarized than ever. Was the decline in Republicans’ endorsement of science and level of climate concern a result of a desire to support their party’s leader, the president, at a time of fierce political dichotomy? A failure by the scientific community to communicate the vast consensus skillfully enough? A failure by the news media to reflect that consensus? President Trump’s skill at rallying his backers to his view on the issue? All or some of the above? It’s all of it – and more. For example, it doesn’t help that the U.S. is having a cold spring either. But on the whole, we can be optimistic. The majority of Americans recognize climate change is real. What matters is what, if anything, we do about it. I’m hopeful. In an overwhelming consensus, scientists say global warming is happening, mainly human-caused and already disrupting the climate system. 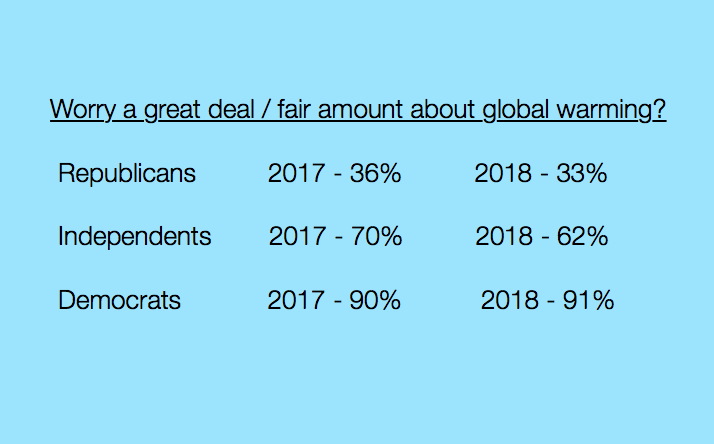 Gallup’s latest annual poll on environment and energy, conducted in March, found wider partisan disagreement about those basic facts of the climate issue and other points. Image credit: Top chart – Texas Climate News from Gallup data. Bottom chart – Gallup.